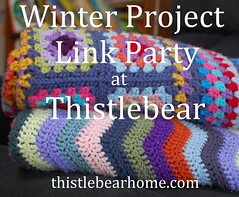 Welcome to February's Winter Project Link Party! I hope you'll join me in sharing your current crafty projects in a supportive, encouraging link-up. This month, I'm sharing yet another blanket-motif start in a long series of them as I try to figure out what I want for a new bed-sized blanket. I've shared so many different ideas over the past year and none of them have felt right to me. But I think I may have finally found something I love! Can you believe it? I've been so wishy-washy. I've been getting bored easily and even starting to think my crochet race has been run. It's depressing, really. This time, I'm feeling that old twinge of excitement and it's wonderful. Crochet is fun again! These are Sunburst granny squares - well, the centers of them. I made one complete square so far to try it out, but I'm leaving the rest unfinished for now while I decide how I'd assemble a blanket made of them. I'm leaning toward join-as-you-go, because there will have to be a LOT of them to make a queen-size blanket, and also because I really enjoy JAYG - to me, it's a little like a puzzle as it all comes together. Anyway, I have long admired Sunburst squares, but I was very intimidated by the idea of trying new stitches, so I hadn't tried them. These new-to-me stitches are the puff stitch and the cluster stitch. In reality, they're no trouble at all! They're easy and fun. I found a great pattern for Sunburst squares, by Priscilla Hewitt (click here for a PDF of her pattern), where the stitches are explained really well. I've adapted the pattern a bit; my squares will be made with the first four rounds only. In the above photo, the purple round is puff stitches and the green round is cluster stitches. I really like the shapes of them. 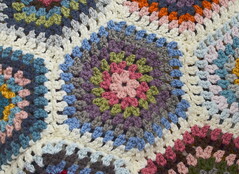 Who knew a granny square could be so liberating? I'm using Stylecraft Special DK, as I often do for blankets. I'm a huge fan; the colors are beautiful and it's really nice to be able to play around with yarns, trying different ideas, without worrying about wasting yarn. This is real life as a crafter, people. I've been piling discarded motif attempts on a shelf above my desk for the past year. I have six different things up there as we speak: large traditional granny squares, large hexagons, circles-in-squares, a flowery square called Paeonia, flowery hexagons and a couple of others. Not seen are small solid hexagons and small bulls-eye squares. It's been a slog, what can I say? If our bed can be dubbed the crochet museum by a certain local wiseguy, then this shelf must be the crochet graveyard. Much more peaceably, I've also been moving toward starting a small cross-stitch project. Last spring, I completed Stitchrovia's Retro Kitchen design, with plans to make two more small kitchenware pieces by the same designer. I'm starting with Little Red Coffee Pot and will also make Little Vintage Tea Pot, both to hang in the kitchen. I'm really excited to stitch again; it's been about three months since I finished My Sweetiepie ABC's. Jennifer, what a great granny's. I love them. 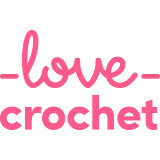 Both beautiful projects but I am always drawn to a crochet project. 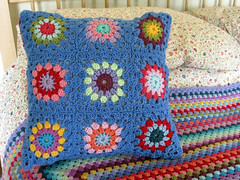 I love the granny square that you have come up with and the stunning colour combinations. It will certainly make a magnificent blanket like Teresa said and a stunning family heirloom. What a clever granny 'square with a round' - I love it, and it is a new one to me too. It will be very pretty as a blanket. And I can't wait to see the little red coffee pot and the vintage teapot. Cross-stitch is so soothing, and I am enjoying picking mine up again. Those are such cheery little squares! It's going to be a beautiful blanket. I think the Sunburst squares are a great idea, I'm liking all the colours you're using. I love vintage and retro kitchenalia and would love to stitch that retro coffee pot pattern. I'm currently working on a Spring-themed sampler and I am really enjoying myself. Good to hear you are out of your funk.. and i'm not surprised that is was these beautiful cheery sunbursts that did the trick. I absolutely love the colours you're using. Stylecraft Special is always a winner with me!